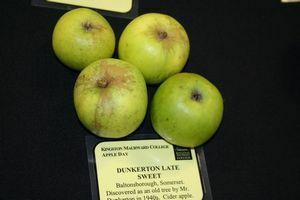 Dunkerton Late Sweet - Cider Apple Tree £12.75 - Cider Apples - Sweet Apple Trees and Fruit Trees For Sale. Buy at competitive prices with wholesale discounts. Dunkerton’s Late Sweet forms a fairly vigorous and well spurred tree with good general disease resistance. 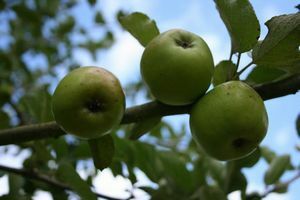 It is useful as a late season variety, with apples ready for harvesting in late November. It makes a sweet, light and fruity cider, good for blending with more tannic fruit. Originated as a seedling from Baltonsborough, near Glastonbury.